Double Chocolate Cake - Four layers of dark chocolate cake filled and iced with chocolate Italian meringue buttercream. White Sour Cream Cake - Four layers of white cake filled with vanilla Italian meringue buttercream. Lemon Kiss Cake - Four layers of white cake filled with alternating layers of homemade lemon curd and lemon Italian meringue buttercream. Raspberry Kiss Cake - Four layers of white cake filled with alternating layers of raspberry filling and raspberry buttercream. Banana Cake - Four layers of my grandma Ann’s delicious and moist banana cake, filled with Italian meringue cream cheese buttercream. Carrot Cake - Old fashioned carrot cake with pineapple and coconut. Four layers filled with Italian meringue cream cheese buttercream. GLUTEN FREE OPTION AVAILABLE. Pumpkin Spice Cake - Four layers of the best pumpkin cake you will ever taste filled with cream cheese Italian meringue buttercream. Wedding cakes are our specialty! 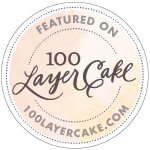 Twice named to BuzzFeed's list of best wedding cakes in the world in both 2014 and 2016, Rosycakes stands out in the wedding cake industry! Want to taste our cake? Just call or email the bakery to arrange to pick up a tasting box! For $20 we will send you home with a box of six of our most popular flavors and three of our most popular filings to taste in the comfort of your own home. This fee is applied to your wedding dessert order once you book with Rosycakes (if the order is $300 or more). After you taste you can email us with any questions! We can go over your guest count and design ideas to come up with a quote. Feel free to ask us to help you! We are expert cake designers! Our online gallery will give you a good idea of our preferred design aesthetic. Starting prices for wedding cakes are $5.50/serving for naked and buttercream iced cakes and $6.50/serving for fondant covered cakes. Final price for a cake will be determined by cake flavor, filling, and complexity of design. Fillings are an additional .50/serving. Sheet cakes are available starting at $3.50/serving when purchased with a cake serving 75 or more. Cupcakes are available starting at $30/dozen. Our apple pie is priced at $5/serving. $100 non-refundable deposit and a signed contract is required on all wedding cake orders.